Regarding Nogizaka, what is the meaning of Under? 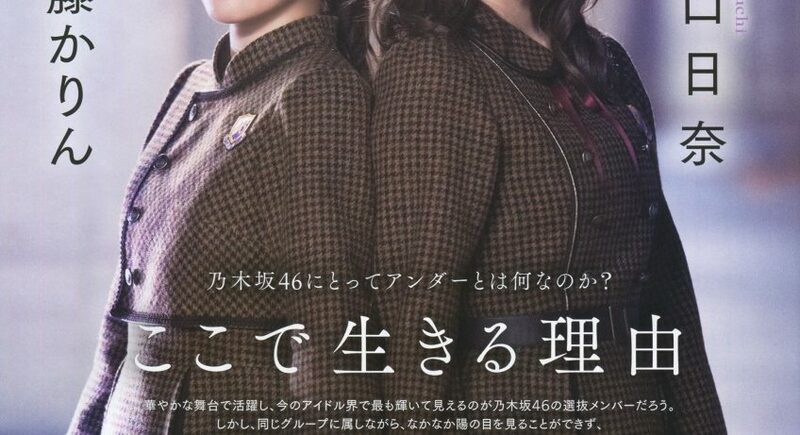 Today, we will talk about the subject “regarding Nogizaka46, what is Under exactly?”. First of all, how do you keep your motivation during the period of a Nogizaka single? Higuchi I was active as an Under member all the time. My feelings changed drastically since I graduated from high school (in March of last year). Also going to school was of course very hectic. If I were to enter Senbatsu, I would probably become even more busy. But I decided to combine it with school. I wanted to work hard until I graduated properly. During that time, Senbatsu was a very distant goal. I wanted to enter Senbatsu someday, but during my studies, I didn’t worry about it as much as today. “I am going to school”, was my reason. But when I graduated from high school, I had more time for Nogizaka activities, and also many people began to come to handshake events, so little by little, I actually felt there was growth. Because of that, the goal of entering Senbatsu became much clearer. Because giving up on entering university means concentrating fully on Nogizaka, naturally there were more Nogizaka related things to consider, but being an Under is very enjoyable as well. Before, I was always on 3rd row, but gradually I came to stand in the front row. And I also became able to look at the camera I used to dislike so much. Did you dislike it that much (laughs)? Higuchi My self-confidence has grown, didn’t it? My current motivation is to become someone able to pull the group, because I will become 20 years old very soon. In order to do so, I think I first have to discover the meaning of my existence in Under. Because by doing that, I think it will lead to who I am in Nogizaka as a whole. That’s what I am thinking about lately. When we raise the power of Under, the power of the whole group will rise. I wonder if Under might be unexpectedly the most important thing. Ito That’s very well said. Indeed. You’re not reading from a cue card are you (laughs)? Karin-san, how about you? Ito First thing I agree with is the lack of self-confidence when it comes to cameras. Ito I am the type that tries to get rid of my weak points and improve my strong points, so while listening to her story, I think we advanced in our own way. Also, this is something I say everywhere, but I am not that interested in Senbatsu. I love doing live shows, and the Under live shows are my purpose in life. The most important thing is that because Senbatsu is working hard, we have jobs as well, and for that I am very grateful. What if instead of “Senbatsu and Under”, there will be an “all member Senbatsu”? Higuchi It’s better if Under exists. Ito After all, it’s very sad to be in the 5th row of Senbatsu! In the past we were told “well, it’s the 7th row”. “That far back!”, I thought (laughs). After all, you are visible from the guest seats as well as the television cameras up until the 3rd row. But even though they both have 3 rows, I can express myself better in Under than in Senbatsu. It’s a matter of finding out your value of your existence in Under, right. How did the Kyushu Series in October go? Ito It was great, wasn’t it? Higuchi It was the greatest until now. I think we were able to do it because everyone’s flexibility has improved. Ito We weren’t able to do this until now, isn’t it? Chima (Higuchi) was the greatest of all. I followed her the entire time. Higuchi Because Himetan (Nakamoto Himeka) and Kiichan (Kitano Hinako) were the centers this tour, I entered at the times they couldn’t appear, and it was also decided that I talked during the MC parts although that wasn’t originally planned. But I was able to deal with it without getting worked up. The first time was tough, and there were also parts that everyone relied upon. I didn’t think I came out that far before, so I felt a sense of accomplishment. I was able to say I did my best. Ito According to the producer, the atmosphere of the Under Live was completely different. Because this time someone skilled in producing was in charge, I wanted to create a block where you could firmly hear the lyrics. I was in charge of the MC part of that block, but it was hard to deal with the tension. For myself, it is positive (regarding Under related topics). But the fans listen to the things I say as being a spokesman for all of the Under members feelings. Thinking about what to talk about at those occasions troubled me every evening. Surely, because you have to consider your own feelings and the feelings of other members, as well as the feeling of the fans in a MC part, you must require an unbelievably high skill, right? Higuchi As expected, there is some worry because every fan is unique. I have to get rid of that feeling. But I also want you to see us as we stand on the stage, and I believe Karin as well, but we don’t want to tell lies. Otherwise, it won’t be fair for both members and fans. This time, everyone was thinking about the MC in particular. The song “Under” tends to be relatively heavy. How do you think about that? Higuchi The Under song holds a lot of things one can sympathize with I think. It’s about things people are likely to experience, such as a broken heart or a farewell. Every time I perform it, I always think it’s a fantastic song. Although I didn’t understand it when I received it, I think I can while I sing it. Ito When you want to listen to the song, you can feel depressed right? But, during live shows there are also people that want to make noise. In order to tell a message with this song, I am thinking about how to appeal to it strongly. The song has its darkness, but I don’t like being told “that song is terrible”. Truth is, that is being said. Ito I understand it though when people say “This song is hard to sing isn’t it”. Higuchi I think this song has a message that can be understand no matter in what society you are. At school as well as at work. Because even during club activities or at work, these themes exist right? Ito Shitara (Osamu)-san from Bananaman has talked about this song on the radio. “At first, I thought this song was horrible to sing, but I am deeply touched by the members who sing it with all their might. When you bring it to that extend, it is really amazing”, he said. If it can be perceived like that, I want to cherish it also during live shows. Nonetheless, I wonder if there are members who find it was too heavy. Higuchi I also had to look twice when I received the song. I as like “Eh?”. But, I thought that it might be too heavy for us. Because we have to sing it in order to deliver its message. Nevertheless, we have to accept its message and not be sad about it. If we did, it would quickly become tough for the people watching us. It’s our job to deliver its message. All member live shows or the Under live shows, do the things you want to show and your motivation differ? Higuchi It became like that (laughs). The motivation we have during the Under live shows isn’t there during the all member live shows. Because the production is obviously different, such feelings become natural. Ito No matter what, I am enjoying the Under live shows more. Do you think that each fan has its own characteristics? Higuchi There are those who support the Senbatsu, but also many people who come to see the Unders. But when the Senbatsu appears, all eyes are directed to them. When the Senbatsu are on the center stage, and we are on the main stage, we only see the backs of the audience. Because everyone looks at the Senbatsu. Higuchi At those times, I think “who am I dancing for”, and I become sad. But that’s the reality. How do you get over that sadness? Higuchi Although there are just a few, you have no choice than to believe there are people that are watching you. Compared to that, an Under live show gives a feeling of security. Because everyone knows who we are, and the audience are supporting us by cheering and rooting for us to become Senbatsu, so it seems that’s the place I am aiming for. Ito Exactly. Are there also fans that cry during an all member live show? Those people are gathering at an Under live show. There is a passion that gets you crying easily. I think it’s because there’s love. There is a different way of supporting idols on those shows, isn’t there? Ito Since we became big enough for Tokyo Dome, people that don’t know us at all come to see the shows. But it’s a… battle to get discovered by those people (laughs). Higuchi-san, do you remember the goal for this year you set in the beginning of this year? Higuchi Do you mean “become a regular Senbatsu member”? That’s correct (laughs). But, that’s quite unlike the current situation. Higuchi Yes, it is. But I still hold those feelings, and I still want to become someone that makes a presence in Senbatsu as well. I think I might be able to become like that, If I can find more reasons for me to exist within Nogizaka. I think I am closer to that than I was back in January. Because you haven’t given up on Senbatsu, I think you feel the same as being selected as center, but I wonder about the differences between a Senbatsu and an Under center. Higuchi I think there are a lot, but because everyone in both Senbatsu and Under is fantastic, it’s difficult. At the moment, I don’t think there are people who want to go to Under being a Senbatsu member. There are a lot that want to enter Senbatsu though. It also makes it difficult that the number of people became too much right? Higuchi I think I would be happy if they changed the name ‘Under’. I think it would be cool if Under was paralleled with Senbatsu to create an organisation with two equal powers. At the moment, with Senbatsu, Under and 3rd gen, Nogizaka46 consists of three brands, but only the name Under gives a negative impression. Higuchi Hihihi. I would be happy if that changes. But now it would be good if I improved myself more, and have confidence. Because if I stay strong, I think I can naturally reach my goal. It’s hard to ask this question, but is it difficult to say “I am Nogizaka46”? Higuchi There are times I lose sight of the fact that I am one of the faces of Nogizaka, and I get reminded by that because I wear the uniform. It is a large group, but on the other hand, I think I fail to live up to it. Higuchi I am very grateful. But I kept wondering who those people were watching in Tokyo Dome. Ito That’s right. Although we managed to go to Tokyo Dome, I guess it’s a part that we carry with us. Ito Not for me (laughs). Higuchi For me it is motivating, because I will work hard to have a better position the next time I stand in Tokyo Dome. That’s a positive way of thinking. Higuchi Because today’s Senbatsu is almost fixed, only Under can change Nogizaka. By thinking like that, I stay balanced. There are times I become negative, but then I try to think “Under can make a new wind blow”. I want to be the one that brings change someday. However, when I hear the words “new wind”, I am thinking about the 3rd gen.
Higuchi Yes, I see. It is because people like new things. I am thinking about how to compete with that newness. Their freshness is fascinating, and everyone from the 3rd gen is great. But it is also an opportunity to think about how to distinguish myself from them. It has become a great motivation. Because I also think it reinforced the support for Nogizaka. However, I want to think that I am different. Ito There is a Senbatsu because there is Under. Senbatsu is shining, and if Under didn’t exist, the frequency of that glow would be different I think. I am proudly active as an Under member, and I want those that have their eye on Senbatsu to enter it. The 3rd gen is shining, and because I think they are the future of Nogizaka, I want to shoulder that future. Will the 3rd gen and Under someday unite? Higuchi That may change though when there’s a 4th gen. Right. Do you have any last words you want to say? Higuchi Please come to see the Under live shows in the Kinki area! It will be the last live shows of the year!